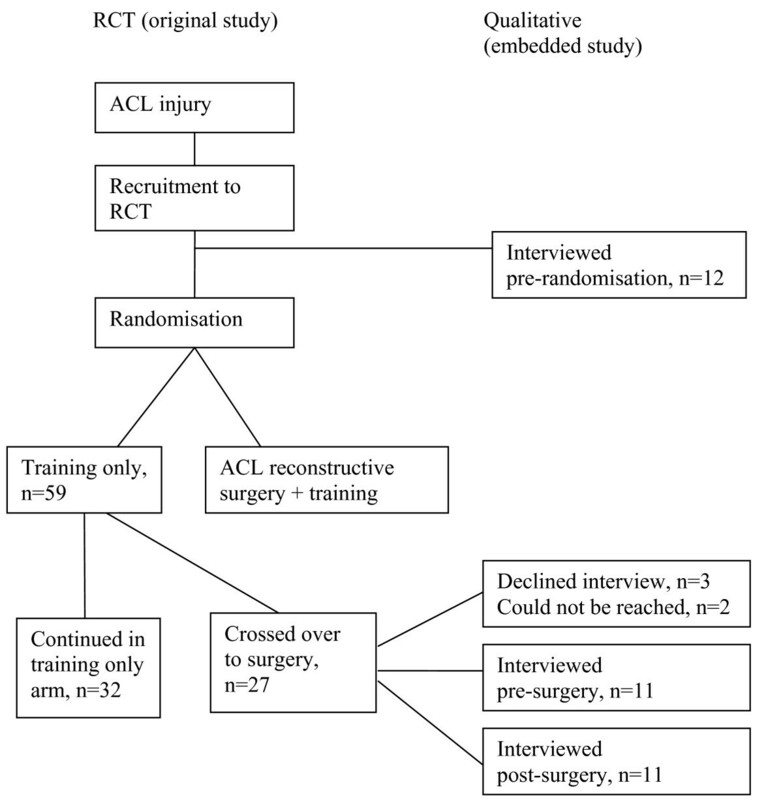 The objective was to understand patients' views of treatment after acute anterior cruciate ligament (ACL) injury, and their reasons for deciding to request surgery despite consenting to participate in a randomised controlled trial (to 'cross-over'). Thirty-four in-depth qualitative interviews were conducted with young (aged 18–35), physically active individuals with ACL rupture who were participating in a RCT comparing training and surgical reconstruction with training only. 22/34 were randomised to training only but crossed over to surgery. Of these, 11 were interviewed before surgery, and 11 were interviewed at least 6 months after surgery. To provide additional information, 12 patients were interviewed before randomisation. Interviews were audio-recorded, transcribed and analysed using the Framework approach. Strong preference for surgery was commonplace and many patients said that they joined the RCT in order to bypass waiting lists. Patients who chose to cross-over described training as time consuming, boring and as unable to provide sufficient results within a reasonable timeframe. Some said their injured knees had given-way; others experienced new knee traumas; and many described their lack of trust in their knee. Patients believed that surgery would provide joint stability. Despite the ostensible satisfaction with surgery, more detailed exploration showed mixed views. Participants in a trial of treatments for acute ACL injury express a variety of views and beliefs about those treatments, and trial participation happens in the absence of equipoise. Furthermore, opting for surgical reconstruction does not necessarily provide patients with satisfactory outcomes. Definition of successful outcome may require an individualised approach, incorporating patients' as well as surgeons' views before treatment decisions are made. Knee injury, including ACL injury, is a known risk factor for the development of knee osteoarthritis (OA), and it was estimated that about 50% of all individuals with an acute ACL injury develop knee OA within 10–15 years [1–4]. There is no consistent evidence to suggest that ACL reconstruction actually prevents the development of OA [1, 5]. The lack of clear evidence about long-term consequences related to different treatments can partly be explained by factors precluding randomised controlled trials (RCTs) comparing surgical and non-surgical treatments, and the difficulties of recruitment into such trials. A lack of clinical equipoise, i.e. true uncertainty about which treatment is most effective, is common among surgeons and sometimes precludes surgical RCTs [6, 7]. The influence of patients' preferences and perceptions of equipoise on compliance and willingness to participate is not well explored, and often based on hypothetical trials [8–10]. Even among participants who agree and understand both clinical equipoise and the process of randomisation, about 10–15% still have a preference for a particular treatment and hope to be randomised to that particular treatment arm [8, 11]. Trial participants' decisions to leave their allocated intervention arm and 'cross-over' to an alternative intervention confounds interpretation of outcome and has been described as a possible problem in trials of surgical treatments . In a trial comparing surgical and non-surgical intervention for lumbar disc herniation, 30% of participants in the non-surgical treatment arm crossed over to the surgical treatment arm . Studies exploring in-depth the reasons for cross-over in musculoskeletal trials are rare. Our study aimed to understand patients' views about treatment after acute ACL injury, and to explore why patients crossed over from the training only to the surgical and training treatment arm despite consenting to participate in a trial comparing the two treatments. Participants in this qualitative study were recruited from an ongoing RCT: the KANON-study (ISRCTN 84752559, http://www.controlled-trials.com). The RCT aims to explore short term (2 years) and long term (5 years) effects of surgical reconstruction plus training or training only. Patients aged 18 to 35 years, with a moderate to high level of physical activity and with a complete rupture of the ACL were randomised either to arthroscopic surgical reconstruction followed by physiotherapist supervised outpatient training (exercise), or to supervised training only. Physical activity was assessed using the Tegner activity rating scale , graded from 1 (activities like walking on even ground, playing cards) to 10 (football, rugby, wrestling at a high (national) level of competition). Moderate to high level of physical activity was defined as 5–9 on the Tegner activity rating scale. The presence of ACL injury was confirmed with magnetic resonance imaging (MRI), and patients were recruited to the RCT within four weeks of their injury. A complete description of inclusion and exclusion criteria is provided elsewhere . The ACL reconstruction was performed within 6 weeks after randomisation using bone-patella tendon-bone (BTB) autografts  or quadruple hamstrings (Semitendinosus/Gracilis tendon) autografts . The training protocol was based on a consensus report of rehabilitation of ACL injured subjects, developed by the Swedish Association of Sports Medicine and consistent with published literature , and identical for all subjects regardless of treatment arm. The training was moderately aggressive and supervised by physical therapists. Pain, swelling and general discomfort slowed down the progression. Those treated with ACL reconstruction therefore proceeded at a slower pace through the first 2–3 months after surgery. Before randomisation all participants received a DVD containing an interview with an ACL-injured patient not included in the RCT, and a panel discussion with three experienced orthopedic surgeons regarding scientific evidence and clinical opinions for and against the two treatment options . In the clinical trial 19% of potential participants declined to take part due to an existing preference for one of the treatments . The number who declined participation because they were unwilling to be randomised to surgery (n = 23) was 3-fold the number of patients unwilling to be randomised to the training-only arm (n = 8). As this qualitative study aimed to explore the issue of cross-over, participants comprised those individuals who had been randomised to the non-surgical treatment (training only) arm but who had subsequently decided to have surgery. The Knee Injury and Osteoarthritis Outcome Score (KOOS) [18, 19] was completed at the time point for cross-over to assess participants' knee symptoms. December 31st 2007 was regarded as "end-point" for inclusion in the present study. Of the 59 trial participants randomised to the training only arm, 27 (46%) had crossed-over to surgical reconstruction by the end of 2007 (figure 1). All 27 were invited to take part in this study, some of them before their surgery, and some of them afterwards. On average, cross-over was taking place 14 months (range 3–52) after inclusion (table 1). In addition, a group of patients who had consented to take part in the trial but who had not yet been randomised were approached (figure 1). This provided additional information about the views of patients at a time when their opinions were as yet unaffected by the experience of participation in either treatment arm. Patients gave written informed consent to take part, and ethical approval was provided by Lund University (LU 535-01). Flowchart of recruitment to qualitative interviews. All patients in the training only treatment arm who opted for surgery between January 2006 and December 2007 (n = 12) were contacted by telephone and invited to the pre-surgery group. Eleven patients (6 men and 5 women) consented to take part and only one (a woman) declined participation. All except one of the patients in this group were interviewed prior to surgery. The participant (KA1081) who was interviewed after surgery had undergone surgery just two days prior to interview and the topics covered in her interview were the same as those covered with the rest of the group. Interviews with this group focused on experiences of the training intervention and reasons for requesting surgery. Patients in the training only group who opted for surgery and who had an ACL reconstruction at least 6 months prior to the start of the qualitative study (n = 15) were invited to take part in the post-surgery group. Eleven patients (9 men and 2 women) agreed to be interviewed. Two could not be reached by telephone (one man and one woman). One man preferred not to be interviewed, and one man did not attend the interview and thereafter could not be reached. Participants in this group were interviewed, between 6 months and 2 years after having surgery, about their reasons for requesting for surgery, and their views and experience of treatment of ACL injury. The final fourteen patients recruited to the RCT were contacted by telephone before randomisation and were interviewed about their experiences of ACL injury and treatment preferences. Two interviews were excluded from analysis: one due to recording failure, and one woman who had already been randomised at the time of interview. This left 12 patients (9 men, 3 women) in the pre-randomisation group. Two of the men (KC2066, KA2105) interviewed in the pre-randomisation group were randomised to training only but opted for surgery during the study. They also agreed to be interviewed before their surgery as well. In total, 34 interviews were conducted with 32 people, 22 men and 10 women, aged 20–38 (Table 1). Interviews with members of the post-surgery group were performed face-to-face at a place chosen by the participant. Because of limited time between a participant's decision to cross-over and their date for surgery in the pre-surgery group, and from a participant's agreement to take part in the RCT and their allocation to a treatment arm in the pre-randomisation group, interviews had to be scheduled and conducted with some speed while also at the convenience of the participants. Interviews with members of the pre-surgery and the pre-randomisation groups were therefore conducted over the telephone. Each interview lasted between 30 and 60 minutes and was performed by a physical therapist (CT) with training in qualitative research methods and who was not otherwise involved in the trial. An interview topic guide with open-ended questions was used for all interviews. Questions included: Tell me about your injury? How should ACL injuries be treated? Why did you join the randomised controlled trial? For the pre- and post-surgery groups the following questions were added: What do/did you think of your treatment? Why do/did you want surgery? What do you think about your future participation in sports? Themes brought up by the participants were followed-up by probing. All interviews were audio-recorded, and conducted and transcribed verbatim in Swedish. Transcripts were translated into English by the interviewer (CT). Data was analysed using the Framework approach [20, 21]. Briefly, the analysis began with reading and re-reading the transcripts and listening to the audio-recordings to obtain an overview of the data. The data was then coded inductively (indexing), and an index list was developed. The index codes were then further refined and applied systematically to all data. Content-related index codes were grouped together into categories, which were revised as the analysis progressed. Subsequently, the data was organised into "charts", or tables, to allow comparison within and between cases and categories. During this stage the original context was revisited several times to ensure appropriate assignment of data. Patterns were identified, further refined to describe the conceptions of the participants, and illustrated with quotations from the interviews. To ensure the appropriate assignment of indexed data, transcripts and charts were cross-checked by an experienced qualitative researcher (RG-H) on multiple occasions. Participants in the pre-surgery and post-surgery groups described reasons for their decision to opt for surgery despite having been randomised to the non-surgical intervention arm. These reasons were grouped into three main categories: a strong pre-existing preference for surgery; a poor experience/outcome of training; a desire to regain pre-injury status. By comparison, participants in the pre-randomisation group discussed the preference for surgery and their desire to regain pre-injury status and possible determinants for outcome of training. In all three groups surgery was seen as facilitating return to sporting activity, although participants also discussed the possibility of surgery failing and the future risk of developing OA. A common view among members of all three groups was the belief that their own recovery time would be shorter than average. Training was good, it helped me cope at home, to get stronger and dare more. But I reached the line where I felt good but not 100%. I have been somewhat better, but I want to achieve the last bit. It may get worse as well, they've told me that, even though the chances are quite good. 90–95% get well from surgery, that's quite a lot (KC2068, male, pre-surgery group). I had 6 months of supervised training, and then I went abroad and was supposed to do exercises on my own. Maybe if I had had a couple of more months to increase the strength sideways and in [collateral] ligaments. It's my fault; I was the one who moved away (KA2111, female, pre-surgery group). Participants who were interviewed following surgery described their views on their outcome. Four of the eleven participants interviewed 6 months or more after surgery said they were satisfied with the results, while 7 were somewhat dissatisfied. However, these statements appear to mask more mixed views about outcome, for instance, two of the participants who said they were satisfied never returned to their previous sporting activities. Dissatisfaction was related to pain, lack of sensation, difficulties kneeling, swelling after activities, and crepitus. Participants adapted or revaluated their lifestyle to cope with the results. Patient preferences are known to affect recruitment to randomised trials. Patients who prefer one of the possible treatments to the other(s) are less likely to consent to take part [8, 11]. Lack of patient equipoise has been shown in other randomised controlled trials comparing surgical and non-surgical interventions [7, 12]. This qualitative study shows that those participants who agreed to be randomised but who had strong preferences for surgery saw trial participation as a means to circumventing waiting lists. However, this is possibly a phenomenon applicable only to countries where health care is incorporated in the welfare system, and high frequencies of scheduled surgeries result in waiting lists and delayed surgery. On the other hand, waiting lists in standard care could, if combined with training, allow for patients to try rehabilitation before decisions about surgical treatment are made. A screening examination might also be a helpful tool to in the decision-making to determine the chances for physically active individuals to succeed with non-surgical treatment [22, 23]. Some participants in this study decided to 'risk' randomization to the training alone intervention as a first line of approach, but felt that surgery remained an option for them if training did not confer the desired results in an acceptable timeframe. A recent prospective study that aimed to identify potential "copers", i.e. patients who after a screening examination were considered as likely to succeed with non-surgical treatment, showed that 40% of those who were classified as copers still opted for surgical reconstruction . This might be explicable by our findings which indicate that the reasons behind patients' decisions to opt for surgery may in fact relate to strategy and pre-existing preferences rather than ability to cope. There is a strong preference for ACL reconstructive surgery within the orthopaedic surgeon community in the US, in Canada, and in Europe [6, 24, 25]. It is a common belief that an ACL reconstruction is needed to participate in sports, also on lower recreational levels, although evidence from high quality scientific trials in support of such beliefs are lacking . Current sports medicine literature recommends return to pre-injury sports activities approximately 6 months after ACL surgery . Despite ostensible satisfaction with surgery in this study, more detailed exploration of experience showed patients' expectations were often not met. This may be related to the belief that surgery could provide pre-injury status alongside belief in personal ability to recover more quickly than others. The delayed recovery and return to sports after ACL reconstruction surgery are known to cause frustration . Our results show that some patients also feel this way about training treatment alone, as several participants thought it was possible for them to recover faster than average. Failing to fulfil these expectations caused disappointment and frustration, reduced confidence in training and reinforced the desire for surgery. This is supported by the findings from a recently published study showing that 72% of patients who opted for and underwent non-surgical ACL treatment successfully returned to high-level sport activities in the short term . However, 10 years later 67% had undergone surgical reconstruction. Return to pre-injury level of sports is often used as an outcome measure of successful treatment after ACL injury [28–31], and patients often believe that surgical reconstruction of the ACL is needed to be able to practice sports . The return to sport after ACL injury is a much debated outcome . In the present study, which included physically active people, everyone expressed a desire to return to sports. Stability was seen as crucial for successful return to sports, and therefore was an important treatment goal. Although stability alone does not explain the return to sports  and people's views about the importance of return to sports shift during the time they are injured , patients' views about how they may achieve optimal outcomes are key to treatment decisions. The in-depth qualitative interviews enabled participants to describe and define their own experience of ACL injury, treatment, trial participation and cross-over. Furthermore, by the end of data collection no new themes were emerging from the data, which indicates that 34 interviews was an adequate number for this study. By selecting patients from three groups (pre-randomisation, pre- and post-surgery) we were able to explore views from participants at different stages in the clinical trial process. Since the study aimed to examine cross-over, we did not include trial participants who had been randomised and had remained in their allocated arm, whereas inclusion of participants prior to randomisation provided valuable data about preferences regarding treatment options that was still unaffected by the experience of one treatment arm or another. Future work might aim to follow trial participants from both training and surgical arms through the process of a trial in a longitudinal, prospective design. This study shows that participants in a trial of treatments for acute ACL injury express a variety of views and beliefs about those treatments, and trial participation happens in the absence of equipoise. Furthermore, opting for surgery does not necessarily provide patients with satisfactory outcomes, and this may be related to expectations about stability, return to sports and ability to recover. This suggests that definition of successful outcome may require an individualised approach, incorporating patients' as well as surgeons' views before treatment decisions are made. Thank you to all the participants in this study. A special thank you to Kerstin Åkesson, who helped with recruitment and contact details of patients. Thank you also to Pia Andersson and Viveca Wiklund who transcribed the audio recordings. Grants were received from The Crafoord Foundation, The County Governor Per Westling's Memorial Fund Foundation, The Halland County Council. The KANON study was funded by Pfizer Global Research, Thelma Zoegas fund, Stig & Ragna Gorthon research foundation, The Swedish National Centre for Research in Sports, The Swedish Research Council, the Medical Faculty Lund University (ALF) and Region Skåne. CT participated in study design, data collection, analysis and writing of the manuscript. SL, ER and RF participated in design, interpretation of data, and critical revision of the manuscript. RG-H participated in design, analysis, interpretation of data, and critical revision of the manuscript. All authors read and approved the final manuscript.